In 1968, the police department in Menlo Park, California hired a new police chief. 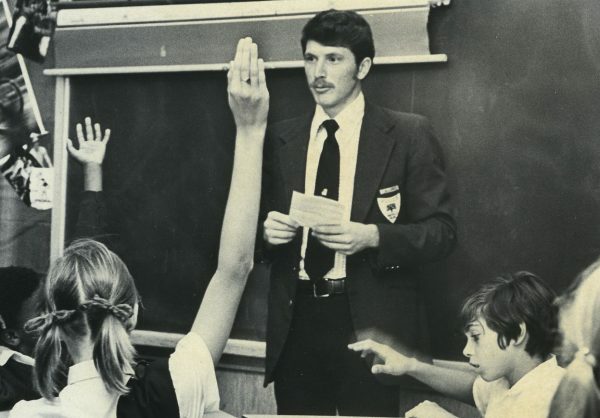 His name was Victor Cizanckas and his main goal was to reform the department, which had a strained relationship with the community at the time. The 1960s had been a turbulent decade in Menlo Park, a small city with wide suburban streets and manicured lawns just south of San Francisco. There were big student-led, anti-war demonstrations at nearby Stanford University. Leaders in the African-American communities of Belle Haven and East Palo Alto were organizing to demand better treatment and services. After years of clashing with protesters, the police department didn’t have the best reputation. Cizanckas wanted to rebuild trust with the community — and he made a number of changes to improve the department’s image. 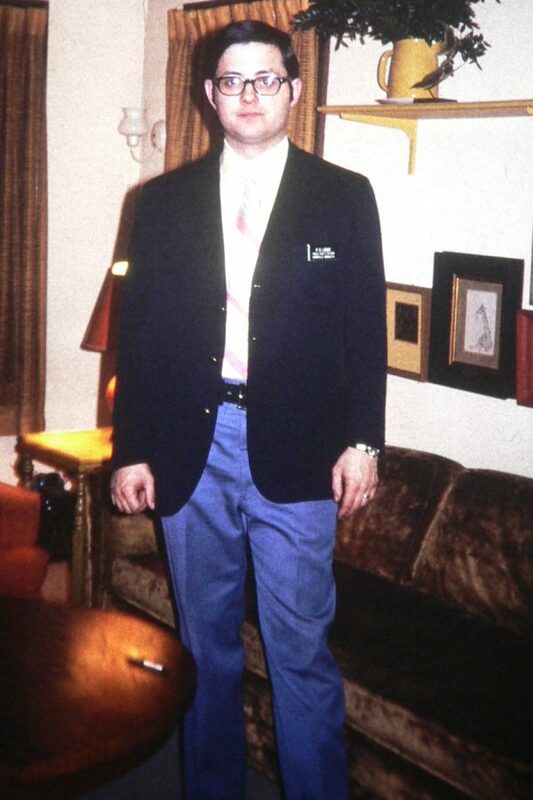 One of the most ground-breaking and controversial was the new blazer-style uniform he implemented. Lieutenant Richard Hutton in the blazer uniform. Image courtesy of the Menlo Park Police Department. For many years, the Menlo Park police had worn some variation of the traditional, pseudo-military, dark blue uniform. But Cizanckas thought that look was too intimidating and aggressive, so he traded it for slacks, dress shirts with ties, and a blazer. Guns and handcuffs remained hidden under the coat. Instead of a metal badge, the blazer sported an embroidered patch that looked a little like a coat of arms. In their new blazer uniforms, the Menlo Park police looked more like preppy college students (or detectives) than traditional law enforcement officers. Some even sported pocket protectors with the Menlo Park police logo on them that would slide into the pocket of their dress shirts. But the new look was only the most visible reform that Cizanckas introduced. He also hired new officers with higher levels of education and from non-traditional law enforcement backgrounds. Several of his recruits had attended the Jesuit seminary in Menlo Park. He emphasized community outreach and required beat officers to take on investigative duties that had traditionally been covered by detectives. He also changed the organizational language of the department, using corporate titles instead of military ones. “Sergeants” became “managers,” for example, and “lieutenants” became “directors.” Officers in the department had mixed feelings about all these changes, but the uniform may have been the most contentious. Dominick Peloso. Image courtesy of the Menlo Park Police Department. That’s because uniforms not only shape how people see the police, but also how police see themselves. In challenging an image so entrenched in the style and psyche of police officers, Chief Cizanckas was bucking a tradition that would prove hard to change: a uniform whose history was interwoven with the profession it represented and that went back more than a hundred years. 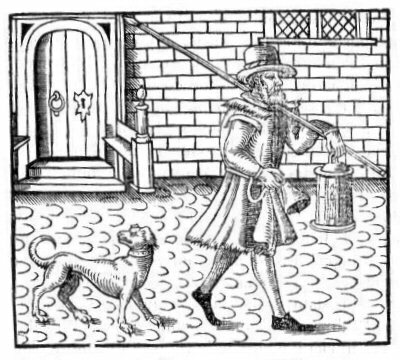 A night watchman by Thomas Dekker from The Belman of London (1608). Back in colonial days, American law enforcement looked very different than it does today. In New England, informal (and non-uniformed) groups of able-bodied men patrolled neighborhoods, looking for crime, fires, and other disturbances. These groups were typically known as “The Watch.” In southern communities before the Civil War, roving slave patrols suppressed slave revolts and tracked down runaways. These patrols typically worked for large plantation owners, so policing in the south was tied closely to the institution of slavery. These unofficial patrols are how early law enforcement worked for decades in the United States and much of Europe. Modern policing only began to emerge in the 1820s, influenced by the thinking of a British statesman named Sir Robert Peel. After years of pushing for reform, Peel helped found the London Metropolitan Police in 1829. 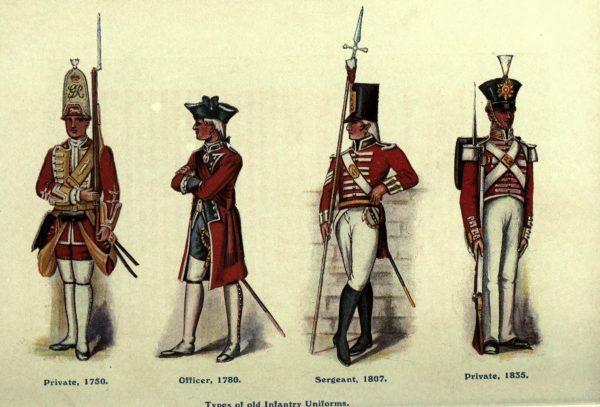 British officers are still known as “bobbies” in honor of Robert “Bobby” Peel. In Ireland they’re often called “Peelers” with a little less affection. 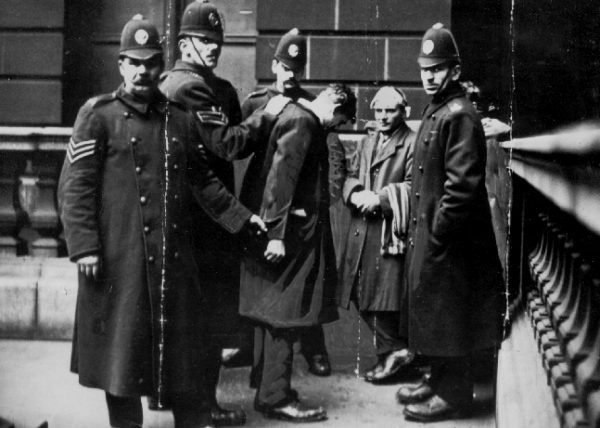 Peel required his officers to wear uniforms that would distinguish them from the citizens they were meant to serve, but he was also sensitive to how the British people might perceive this new police force. He didn’t want them to be mistaken for an occupying army. In an effort to make the new uniforms stand apart from the red coats of the British military, he opted for a color that would contrast: blue. Trench-coated British police officers in 1919. Gradually, Peel’s ideas — and the iconic blue uniform — made their way to the United States. By the early 1900s, police departments across the country had adopted aspects of the policies and style pioneered by the London Metropolitan Police. This included a quasi-military hierarchical structure and the goal of crime prevention. Still, the system was far from perfect. 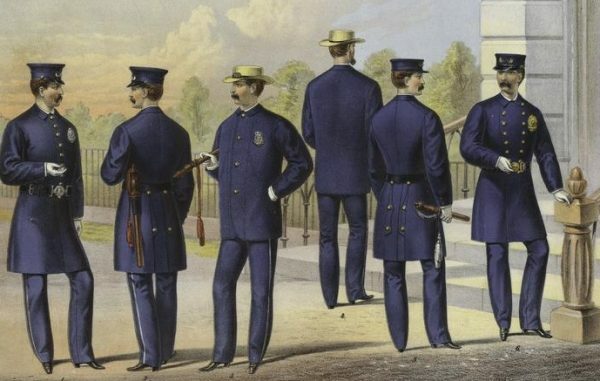 New York City Metropolitan police in uniform, 1871. Most early police departments in America allied themselves with the rich and powerful, including local politicians and business leaders. Many departments operated on a patronage model: newly-elected mayors would hand-pick new police chiefs, who, in turn, would hire family and friends to be their officers. In most departments, recruits didn’t receive any special training; they were often just handed a badge and a nightstick and sent out on patrol. A reform movement began to grow in communities across the country. And then, in 1929, President Herbert Hoover assembled the Wickersham Commission, a group tasked with conducting the first national study of the American criminal justice system. The commission uncovered abuse and corruption throughout the system and brought these issues into mainstream discussion. Spurred by the findings detailed by the Commission, a new and more professional era of policing was born. Proponents of professionalism emphasized better training, more discipline, the use of modern tools and technologies, and codes of conduct and protocols that they hoped would help police better serve their communities. One of the leading voices for police professionalism was August Vollmer, the first police chief of Berkeley, CA and an author of the Wickersham Report. Vollmer required officers to use motorcycles and patrol cars (rather than patrolling on foot) in order to cover larger areas more efficiently. 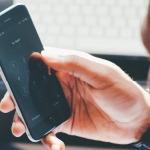 He was also one of the first police chiefs in the United States to insist his department use high-tech methods like fingerprint, blood, and fiber analysis to help solve crimes. Under Vollmer’s influence, California became a hotbed of police reform from the 1920s through the 1960s. Leading, of course, to experiments like Victor Cizanckas’ blazer uniforms. New York Times coverage of the Menlo Park Police Department’s reforms, 1972. Image courtesy of the Menlo Park Police Department. For a time, the reforms Chief Cizanckas had implemented seemed to be working. Cizanckas told the New York Times in 1972 that officer morale was up and that community satisfaction with the department had increased. Certainly, his officers looked less intimidating. An early study even suggested that altercations between citizens and police had declined because of the new uniform. The study’s findings were eventually challenged, but not before news of the reform’s success spread, and a few other departments across the country adopted blazer style. 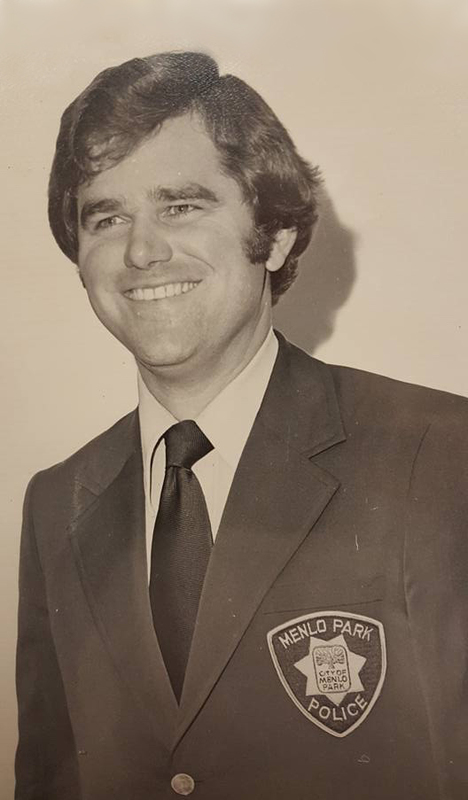 At the same time, the blazer uniform created divisions within the Menlo Park Police Department. Some of the older, more traditional officers missed the dark blue, military-style uniform and all that it represented. Others complained that community members got confused about whether officers were actually law enforcement. Others had problems with the deeper changes to the organization and hierarchy of the department. Many officers quit to take jobs with other law enforcement agencies in the area. A Public Safety Officer with the Burnsville, MN Police Department wears a blazer-style uniform. In the late 1970s, Chief Cizanckas also moved on, taking a new job with the Stamford Police Department in Connecticut. Not long after he left, the Menlo Park Police Department switched back to the more traditional uniform style… Cizanckas passed away in 1980. 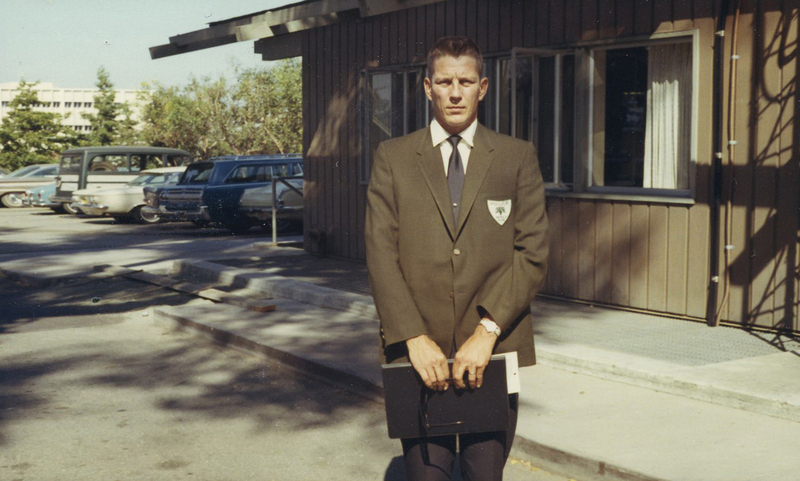 The year that Cizanckas joined the Menlo Park Police Department, 1968, represented an important turning point for law enforcement in the United States. The community policing approach championed by Cizanckas would continue to gain traction through the 1980s and 1990s, as departments across the country tried to build better, less combative relationships with their local communities. But there had always been a tension between the more community-oriented side of the policing and the more military side. And that was about to intensify. The rhetoric of “war” influenced the way many police departments across the country approached their work. 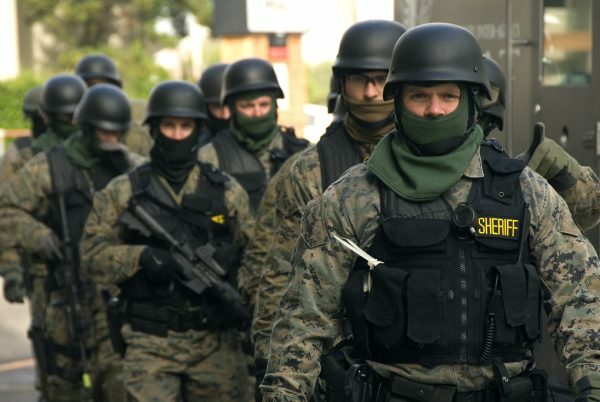 War also requires specialized equipment — and in the late 1960s, the government established the Law Enforcement Assistance Administration, a now-defunct federal agency that gave money to local police departments to buy heavy-duty, crime fighting tools, including riot gear, bulletproof vests, armored vehicles, and weapons. SWAT team members prepare for an exercise via the Oregon Department of Transportation. The trend towards militarization continued through the 1980s and 1990s. 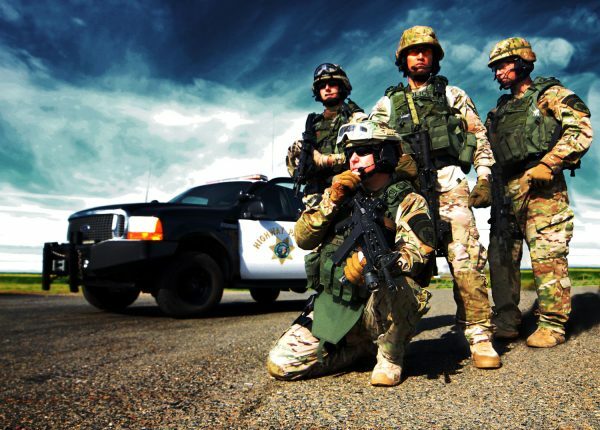 It accelerated in many places after September 11th, as police departments became closer with federal law enforcement agencies and started thinking of themselves as part of the first line of defense in a new war: the “War on Terror.” New federal programs emerged that sent surplus military equipment from Iraq and Afghanistan to local police departments across the country. More recently, there have been highly-publicized protests against police shootings of unarmed African-American men, women, and children. These protests have sparked bigger conversations about police violence — and also the militarized appearance of our police. The current mistrust of police seems to mirror what was going on in Menlo Park back in the early 1960s, but on a more dramatic scale. Today, at least so far, no departments have taken steps as drastic as Cizanckas did at that time. But the Minneapolis Police Department recently took a small step in that general direction. In February of 2016, the Minneapolis Police Department changed the color of their SWAT uniforms from a military green to a more traditional navy blue. This happened about four months after the city saw widespread protests after the police shot and killed an unarmed black man named Jamar Clark. Police officers involved said Clark was attempting to arm himself by reaching for an officer’s gun. Some witnesses said Clark was handcuffed at the time of the shooting. Local and federal investigations have been conducted and no criminal or civil rights charges have been filed against the officers. Of course, the tensions between police and the communities they serve can’t be solved by a uniform change alone. But a change in uniform can be an important symbol — a way for police departments to signal that they want to be more approachable and that they care about how they are perceived. In the case of Chief Cizanckas in Menlo Park, the uniform experiment did help lead to bigger changes. 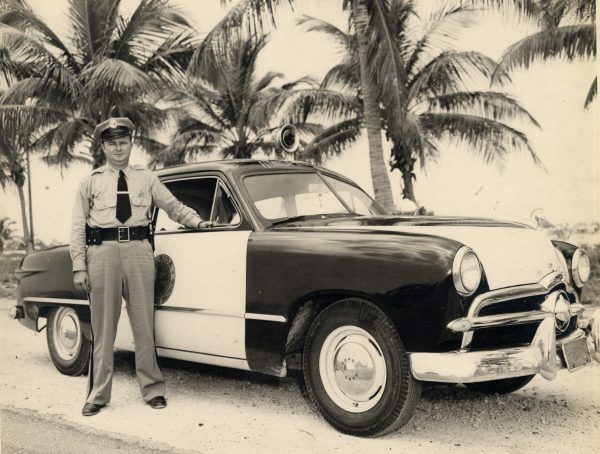 Requiring officers to wear blazers meant a certain kind of officer was drawn to the police department — the kind who was willing to get on board with the more significant reforms Cizanckas wanted to make. Even though the Menlo Park Police Department eventually abandoned the blazers, some of the bigger changes stuck. Most notably, the Menlo Park experiment helped pave the road for a community policing ethos that continues to shape a number of departments in the area today. Producer Delaney Hall spoke with Dominick Peloso, retired assistant chief of the Menlo Park Police Department; Dr. Chad Posick, who teaches in the department of Criminal Justice and Criminology at Georgia Southern University and helped develop the National Police Research Platform; retired Sergeant Van Trask of the Menlo Park Police Department; and Kandace Montgomery, an activist with Black Lives Matter in Minneapolis. Special thanks to Darryl Lindsay of the Menlo Park Police Department; Dr. Richard Johnson of the University of Toledo; Dr. Robert Mauro of Decision Research; David Couper, retired chief of the Madison Police Department; and Tom Dupont of Kazoo Branding in Minneapolis. I wonder if one point of contention was that the blazers were an ugly shade of brown rather than the dark blue that’s traditional for both police forces and blazers. I really dig Rhode Island’s uniforms. They have a nice traditional look and still set them apart as the police. Plus none of the variations are threatening, apart from the one for the SWAT team. But tactical teams associated with the police retain a similar appearance in many other countries as well, so I suppose it’s not a bad thing. Any other fans had issues playing this episode using safari 9.0.3 on OSx 10.11.3 or thereabout? Had no issues on chrome. It would have been nice to have the full story told about the Jamar Clark case…if you bring it up in the light of “an unarmed black man was shot” you should at least complete the full story. Both the local and federal investigations found that Jamar Clark was attempting to arm himself by grabbing at an officer’s gun. The investigations were complete by the airing of this show, there is zero excuse for trying to push a false narrative. Jeff and Todd: Thanks for your comments. We’ve updated the article with a few more sentences and links to fill out a more complete picture of the Jamar Clark incident. Nationally, a pretty decent portion of our police are sheriff deputies, who usually wear brown, tan, or green, and in rural areas, it’s not uncommon for the pants to be jeans. I wonder if that makes a difference in how they are perceived. One counter-trend that I find interesting is police wearing shorts and polo shirts, or similar uniforms, in hotter climates. Some places this might be limited to bicycle patrols but in others it’s more widespread. If you had told me in the 1970s that police might be wearing short pants I’d have questioned your sanity. In the movie, It’s a Mad, Mad, Mad, Mad World, the cops wore a white shirt instead of a blue one. In my opinion, it made them more approachable. I think that the Rhode Island state police are somewhat intimidating because of the boots, the campaign hats, and the Sam Browne belts. Because of this clothing attire, the striking workers of the 1920s called the various state police “Cossacks.” If the Nazis Party had come into existence before the 1920s, I am sure that the state police would have been called the Gestapo or Nazis by the striking workers instead of calling them Cossacks. I think its important to look at this phenomenon from a perspective of incentive versus disincentive on the part of the police forces. Confrontations are basically incentivized by way of first validating law enforcements decisions regarding equipment (“See, we told you we needed these”) and then more funding and similar equipment flows, they get emboldened, and this leads to more relationship strain and confrontation, and it happens all over again. They have no incentive to look less aggressive, because they’re rewarded and “justified” by confrontation. Great story. Got me thinking. I was expecting a counter-point to the militarization trend in that community policing has been credited with secular reduction in certain types of crime. I don’t know the role that uniforms play in this, but walking the beat and talking with people is part of it which is so different from the separation created by paramilitary uniforms, equipment and vehicles. Really, I’m putting my hand up to suggest that there is an important additional theme here. 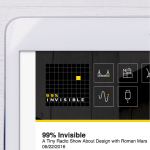 I love the production value of these shows and I certainly love learning about how design affects our daily lives however, I really cannot stand how you alway manage to push a very anti-police, anti-conservative, liberal agenda into each of your shows. At some point in just about every episode is a moment where I roll my eyes, stupefied as to how you managed to warp a show about uniform colour into an anti-police, pro-BLM manifesto. I love the show and I enjoy just about every episode very thoroughly but the overwhelming liberal agenda leaves a bad taste in my mouth. Activist?! No, that hate group are not activists. I’m not going to listen to or download any more of your podcasts. Yes black lives matter is an activist organization not a hate group, J.G. I mean that fact that you even said that is completely and utterly ridiculous. So because I happen to be a nice person and you seem to lack critical thinking skills, let me break it down for you. Black Lives Matter is just an easier way of saying “Please stop killing black people because black people are people too”. If anyone considers that hate speech, well I’m just gonna have to pray for them because there really is nothing left to do. Ignorance has gotten the best of them. Any lack of Irish affection has nothing to do with the Met, or British police at all; it derives from the Robert Peel-founded Royal Irish Constabulary, founded more than a decade before the Met during his tenure as Chief Secretary for Ireland. Thanks! I always enjoy the show and the hard work you put into the stories. yo man love what you do but keep your audio levels even.